This week I have been feeling like kitten heels and boots. It's a weird feeling. 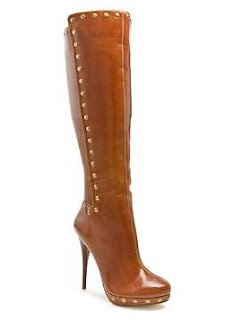 (1) Someone asked on a FB group that I'm a part of about where to find the Shoe Dazzle Dallas boot. Being the good shoe lover/helper I am, I googled the boot and quickly realized that it looked very similar to this one: Ohare by Michael Antonio, $49.95 from DSW.com. The boot is also available in red but only size 6.5 is left. (2) Fall may be scheduled to arrive soon, but I'm not ready to let go of my summer sandals yet! I really love the 'Sands of Time Shoe' by Seychelles, $57.95 from KarmaLoop - I have a special code to get 15% off all items from KarmaLoop + free shipping, so if you want these shoes or any other items on the site, let me know and I'll hook you up! After the discount, these shoes become $49.25. Seychelles is one of my all time favorite brands (I own 8 pairs from them, baby!). (4) These grey chunky heeled oxfords are perfect for fall! Picasso by Asos, $49.99 from Asos. The oxford is very on-trend, and I like that the shoe is not black or brown (just so boring to me!) yet the grey can match with many shades. (5) It seems like every shoe designer is coming out with shoes that have a 'flared' heel. These types of heels are signature to high-street designers like Miu Miu and Yves Saint Laurent. So I'm glad that there are more affordable flared heel shoes out there now! These ones I'm showing you are also from Asos, they're called, 'Playa' priced at $55.16, $49.61 after using a 10% discount (let me hook you up! ).